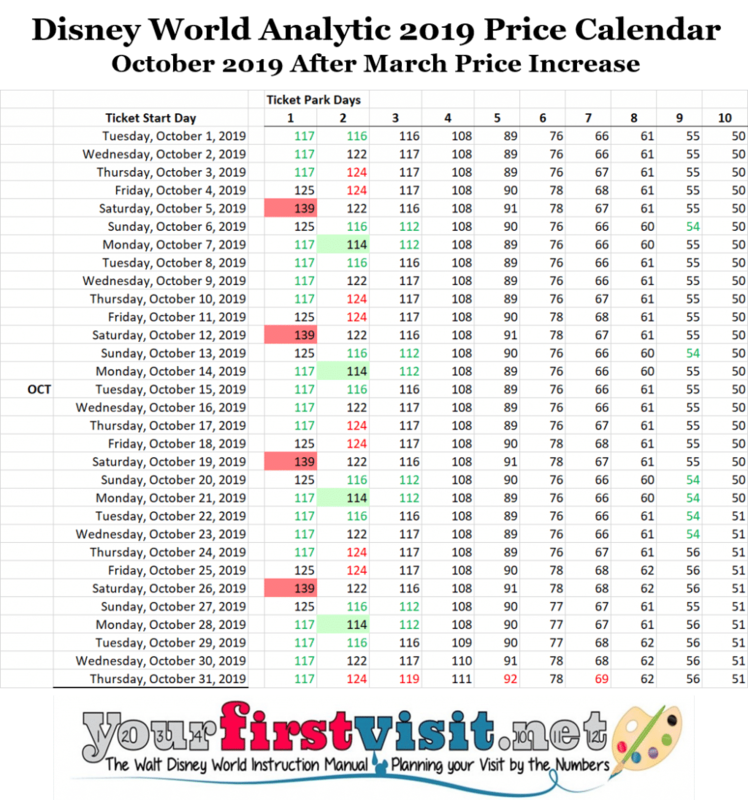 I’ve color coded the start dates of the various base ticket lengths in Disney World’s new date-based ticket pricing system to indicate less and more expensive ticket dates in 2019, beginning in April and compared to available prices the rest of 2019. The prices I show are pre-tax, per ticket day, and rounded to the nearest dollar. The more and the darker the red, the worse. 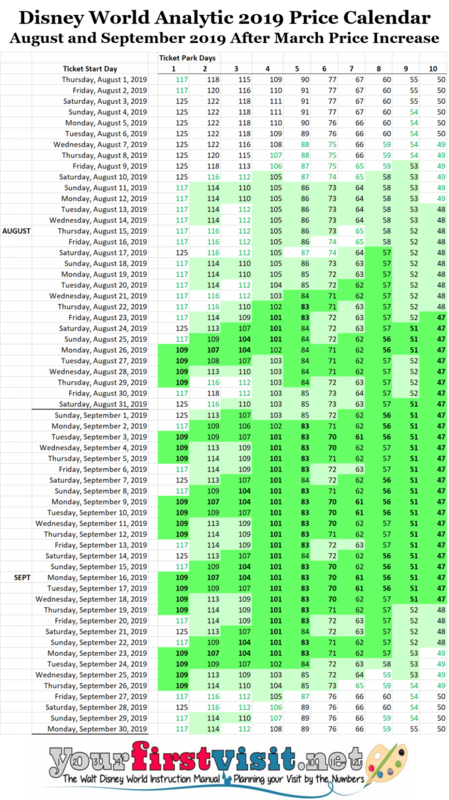 Dates with black text on a white background are everything else–you can think of them as “typical” or “average.” The technical details on how I color coded are at the end of the post. 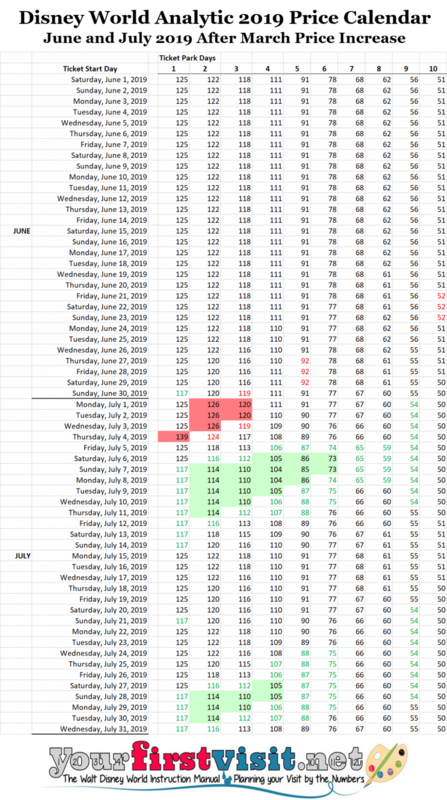 April ticket prices peak for the popular spring break periods before and after Easter, and for the longer ticket lengths are red most of the month. 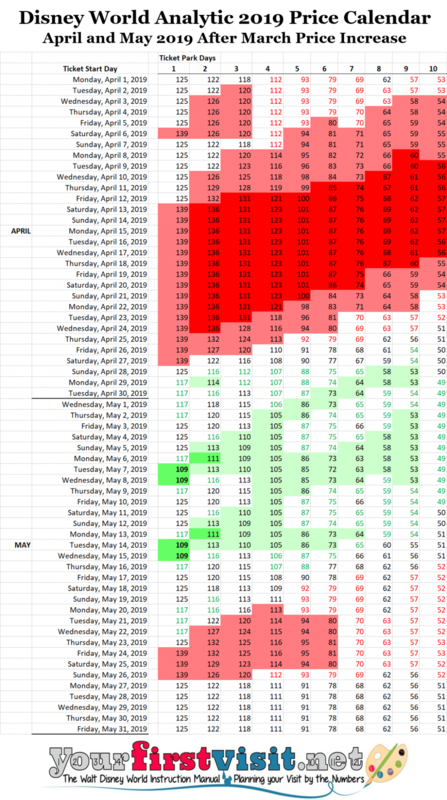 The first half of May shows much lower prices, and then prices start going up to cover the Memorial Day weekend, then go down to average levels after. June ticket prices are largely average. July sees some higher prices for shorter tickets keyed to the Fourth of July, then a mix of average and slightly lower prices the rest of the month. The first week of August has average ticket prices, then lower prices become more dominant. September is filled with lower prices until late in the month. Except for the very shortest ticket lengths, which bounce around, October sees almost entirely average ticket prices. Early November sees some curious higher ticket prices in the shorter tickets. After that, prices are largely average until they go up for Thanksgiving. 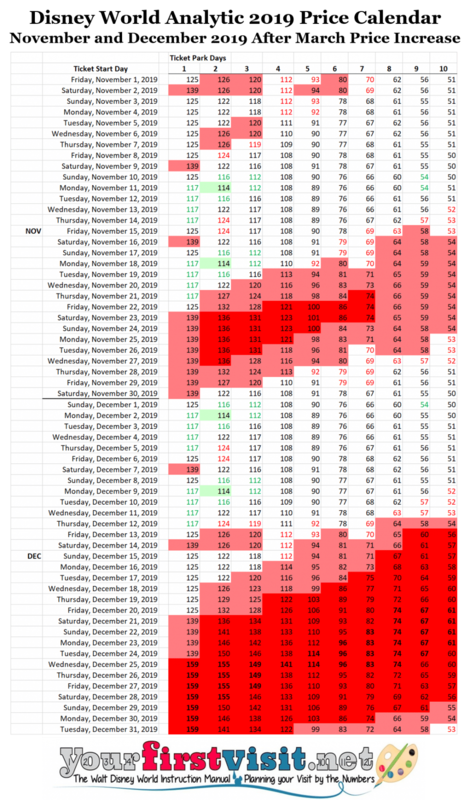 The first third of December has largely average prices, and then ticket prices start going up for the holidays, hitting their highest levels of the year in the last third of the month. Every other price in between has black text and white fill. Note that all my work is based on the rounded prices Disney published and are pre-tax. As a result, the “10%” breaks are not exact. Thanks so much Dave. This chart is amazing. 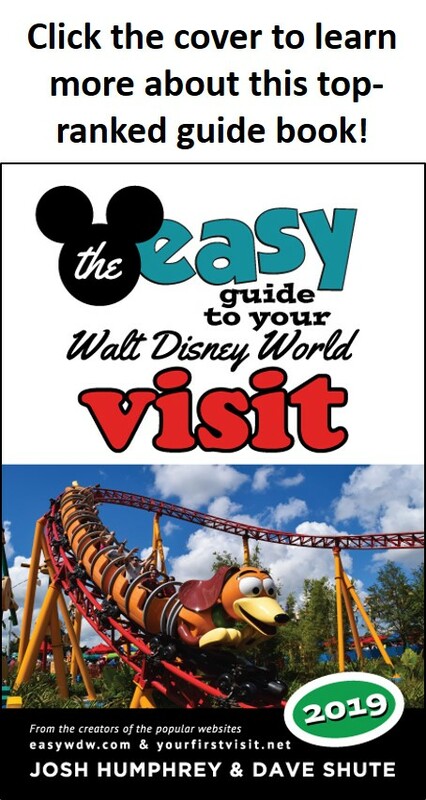 Hi Dave, I saw an article yesterday that briefly said that now that there are differently priced tickets there are no longer any slow days at WDW so you can expect high crowds whenever you go. I thought it was probably too early for that prediction and figured that your previous analysis of when the slow periods are is probably still true, albeit maybe a little less slow than before. What do you think? Jane, it has been true for a while that there are no “easy” days–every day requires a good plan. However, there are clearly still better and worse days. My judgment is that there is not enough of a difference in prices for the new ticket pricing model to much affect this in 2019. The new ticket prices released in March 2019 do show bigger differences from lowest to highest. This may be enough to actually move people from, for example, the second half of December to earlier or later dates. Thank you for this information! My family really appreciates you and this site!